By Shaunna Evans 25 Comments · This content may contain affiliate links. 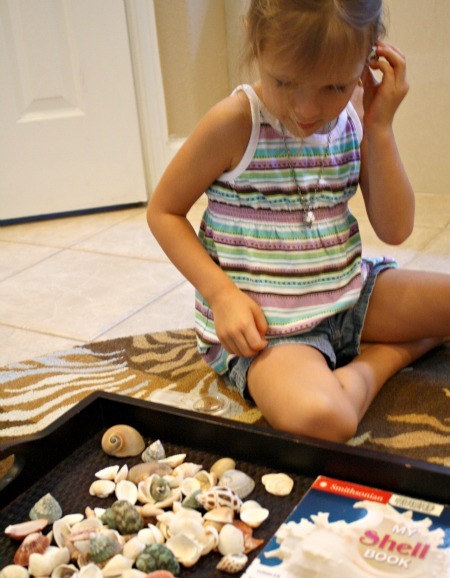 There are so many creative ways to play and learn with seashells. They can be used for math and science explorations. 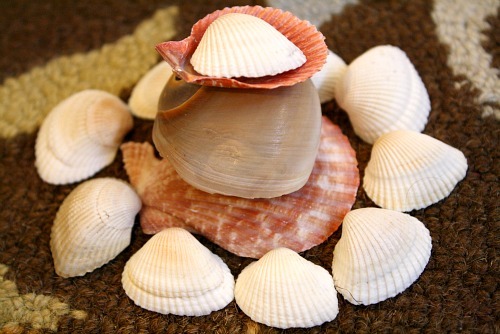 We’ve even used them to inspire a shell snack and some seashell painting process art. 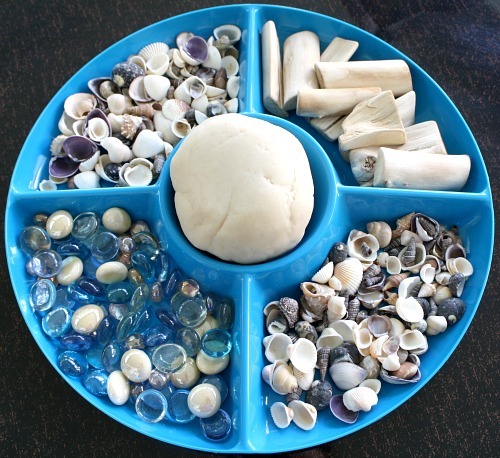 Continue the fun with these three invitations to play with shells. If you follow us on Facebook or Instagram, you probably already know that we’ve been doing more and more invitations to play. The kids and I are really enjoying a shift to more child-led learning, and these open-ended activities have been a large part of that. If you aren’t familiar with invitations to play, Teach Preschool has an excellent overview and tutorial. For our purposes, I like to divide our play invitations into three categories: invitations to explore, invitations to play, and invitations to create. This helps me remember to incorporate scientific investigations, open-ended play, and creative opportunities into our weekly themes. Of course, some invitations could be assigned to more than one of these categories, so it’s just a general guideline for me. Below are three of the invitations we set up to go along with our shells theme. Our first shell activity was an invitation to explore. 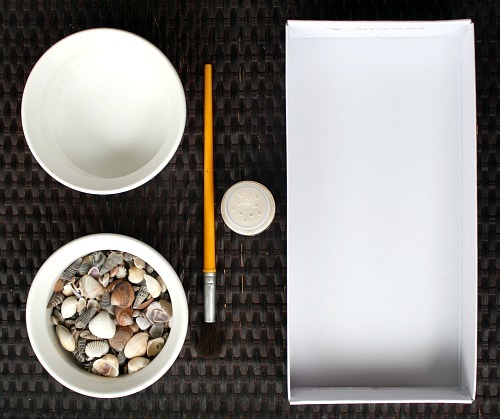 I set up a tray with different kinds of shells, magnifying glasses, and My Shell Book. The girls were immediately intrigued, and they started exploring right away. By the way this exploration took place in my bathroom while I was getting ready in the morning–play and learning happen everywhere, right? The girls examined, sorted, and played with the shells for quite some time. Tinker preferred to line them up along the floor, and Lovey ended up making some very interesting shell sculptures. Another day we set up an invitation to play with coconut scented play dough, shells, glass beads, and small pieces of drift wood. The girls spent a lot of time playing with these materials, and it’s an option we still have out in our play area after a couple of months. I always like to see what they make and listen to the stories and pretend play that develop along with their creations. 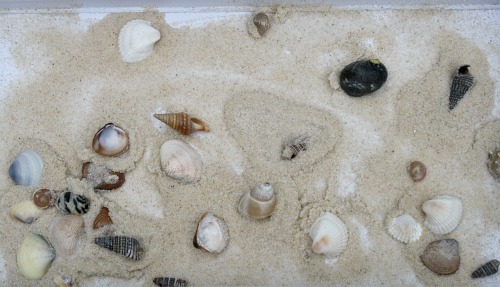 Our final shell invitation was an invitation to create sand and shell art. We set up a paint brush, sand in a shaker (ours is an old spice jar), glue slightly thinned with water, small shells, and a shoe box lid. The girls covered the inside of the lid with glue and then added shells and sand. They both enjoyed the process, and the end product made cute little beach decorations to have on display for the summer. For more great beach and ocean activities visit our Ocean Theme Pinterest Board. 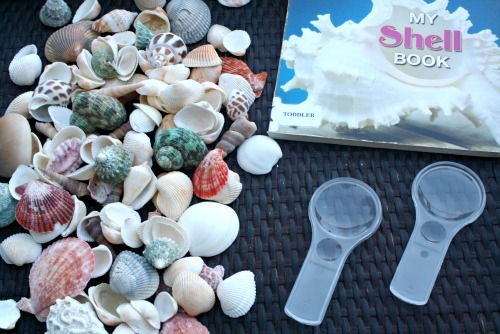 You’ll find crafts, snacks, books, learning activities, play ideas…and even more ideas for playing and learning with shells! 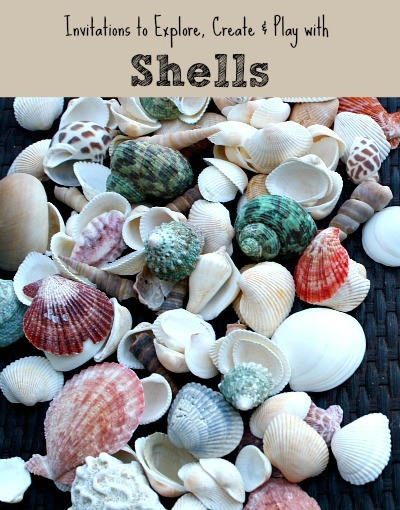 I love this idea, and we’re currently living at the beach, so we have shells galore! Can I ask how you made the playdough coconut-scented? I can just imagine how good that smells! We used coconut extract for the scent, and I love it! Love these. I grew up on the ocean and now live far away. This would be a great way to bring the ocean to my kids. I would love for you to come link up on Artsy Play Wednesday. Aren’t they lovely? 🙂 Thank you for the feature! That invitation to play station is such a great opportunity for open-ended exploration. I love this! We just got back from vacation and the kids collected bags of shells and rocks from the beach. When we do our ocean unit later this year (I’m waiting until there is snow on the ground so that we can fondly reminisce about being in the sun! ), I will be incorporating some of your wonderful ideas! What a smart idea to save the shells for winter! I’m sure it will be such a fun way to remember your vacation and take a little mental journey away from the cold weather. I love how simple and fun these learning and play activities are. We are featuring your post tomorrow on Share It Saturday. Thanks for linking up! I love how you have your invitations to play categorized. What a great way to keep organized. Thanks! It’s been a big help in planning activities for the kids. Visiting from Dollie’s link up — I just found a whole box of shells in the attic (go figure! ), so this will be perfect! What perfect timing! I hope your little ones have fun! I’m a preschool teacher and am wondering where you got the sorting tray. Very nice invitation to play. I find these sorting trays at Walmart. They seem to have a few out year round. The colors usually vary by season, which makes it easy for me to grab different ones to go with along with our activities. If I remember correctly they are only $1 each (maybe $2). We get a ton of use out of them–for invitations like these ones, snacks, paint trays, etc. They also stack nicely together which is nice for space saving purposes in a classroom. 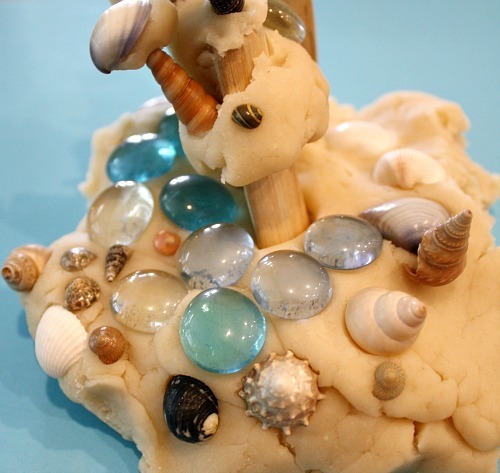 Loved this post as our current theme for this week of the summer holidays is “Under The Sea” so these activities fit in perfectly. Will definitely be giving them a try. 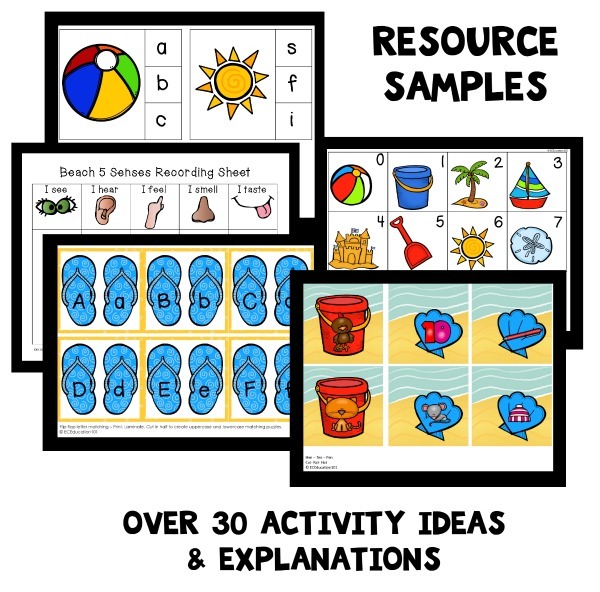 Thanks for posting, found your blog via I Can Teach My Child. I’m so glad the timing worked well for you, and I hope your kids enjoy the activities. Thanks for stopping by! I adore this, Shaunna! Just beautiful. Love the sand and shell art! Great sensory experience with an awesome finished product. I bet the kids were proud! What great open-ended learning – you do such a great job with that!